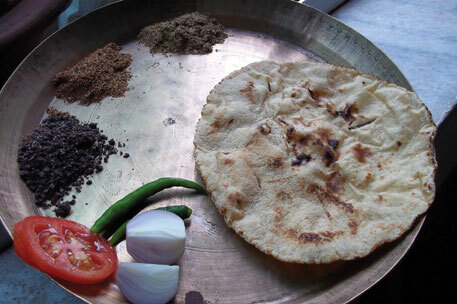 Dry powder chutneys are one of the characteristic features of Maharashtra cuisine. There is nothing like a dash of hot and peppy dry garlic chutney or roasted gram or peanut chutney to liven up a simple meal of dal and sabzi. What’s more, once prepared, dry chutneys can be stored at room temperature for a month or more to be dished out as and when needed. Convenient, right? Usually, these mouth-burning assortments are associated with taste, not health, and those overly fond of dry chutneys get gently teased about what the veritable firecrackers are doing to their insides. But some chutneys prepared from oilseeds, for instance jawas (linseed or flaxseed), khurasni (niger) and kala til (black sesame), have far-reaching health benefits. Unfortunately, with changing agricultural practices and food habits, these oilseeds are disappearing, especially from the rural platter where they used to be integral parts of the meal either in the form of cooking oil or dry chutney. Before the advent of commercial agriculture in Maharashtra, linseed and black sesame were grown across the state as part of both rabi and kharif crops. Niger was confined to eastern Vidarbha and the Sahyadris in western Maharashtra. All three were cultivated mainly for their oil. But with growing popularity of groundnut and soybean oils as the cooking oil, the acreage of linseed has reduced drstically. 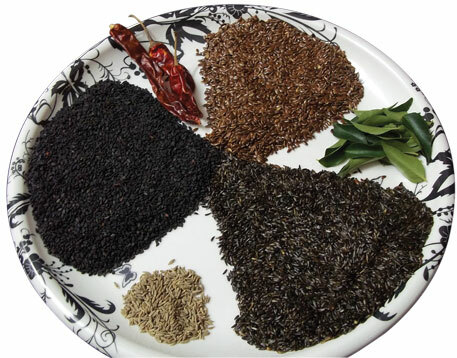 Black sesame has been replaced with the commercially valuable but less nutritious white variety, while niger is now grown by the tribals of Vidarbha and Sahyadris in small quantities. Traditionally, all the three seeds are considered good for enhancing strength and preventing illnesses. Health benefits of linseed and black sesame are well documented. Linseed is rich in Omega 3 fatty acids, fibre, high amounts of plant estrogen and anti-oxidants, apart from several B-complex group of vitamins and minerals such as calcium, iron, magnesium and zinc. Modern research has associated linseed with prevention of heart diseases, diabetes, stroke and cancer. Regular consumption of linseed is also known to prevent and cure constipation, indigestion and flatulence. Black sesame seeds are known to be rich in calcium, magnesium and several trace minerals. They also help lower cholesterol levels in the blood. Its oil is known to prevent premature ageing and graying of hair. The benefits of niger seed are less well documented, but tribal wisdom says their health benefits are similar to those of black sesame seeds. Traditionally, niger oil is used as a massage oil. Its therapeutic properties offer relief in case of aches, pains and skin problems. Tulsabai Lahange of tribal village Karewadi in Ahmadnagar district, who showed Down To Earth how to make the chutneys, says chutney is an easy way to consume these seeds regularly in small quantities. Another way is to add a spoonful or two of the roasted seed powder to curries. It improves the taste and brings down the oil requirement of any recipe, she adds. Chutney can also be mixed with dough to prepare spicy rotis. Nandeesh Churchigundi, an organic farmer from Shimoga district in Karnataka, says it was customary in his area to consume a spoonful of linseed and niger chutneys with alternate meals. The combination offers wholesome health benefits. Now, with modern medicine’s emphasis on omega 3 fatty acids, people are consuming only linseed, says he. “Have a spoonful of any chutney with each meal daily for a month, and you will feel the difference in your health status,” Lahange says. “Your aches and pains will be gone or reduced. You will feel lighter and energetic, and your bowel movements will be regular and easy,” she declares. However, she warns that city dwellers would do well by reducing the quantity of red chillies in the chutneys. Roast linseeds lightly in a pan. Stop roasting when the seeds stop crackling, else they will get burnt. Roast chillies and cumin seeds separately. Let all ingredients cool and then grind them to a coarse powder. Add salt. Store the dry chutney in an air-tight container. Serve with meals. Note: The above method can be used to make niger and black sesame chutney. To trust the tradition of centuries, we believe & relay on decade of scientific research. Its better to recall & to follow our own local diet from elders of our place. Fantastic article ! Learnt a lot about oil seeds that i knew some about and that are grown in areas ive worked in Uttrakhand. Though same story of reduced cultivation.. And ive been excited abt dry chutnies with precisely these ingredients.. So big Thanks !